This Eglo Faedo 4 white finish 50w LED outdoor PIR security floodlight is rated IP44 and ideal for protecting a large area after dark. Cast aluminium construction, with rectangular head fitted with 50w of cool white (5000k) LED’s that give a very bright 4800 lumens of pure white light. 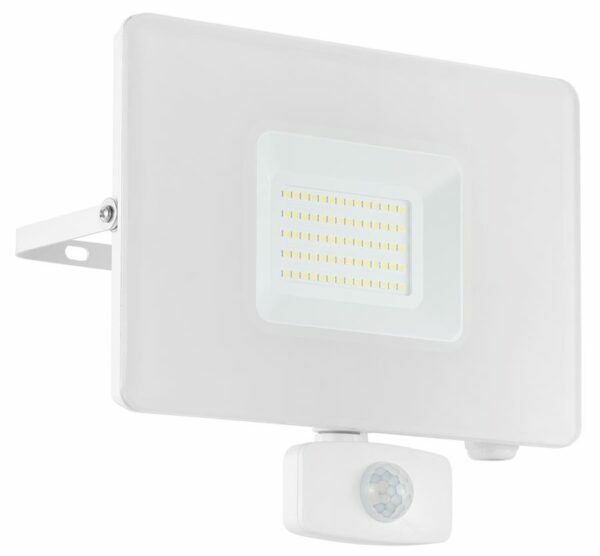 The motion sensor has a maximum range of 12m and is adjustable for activation time. Add a bit of extra security to your outside space with this Faedo PIR floodlight. The modern design is attractive and can be used to illuminate a large area when people approach during the hours of darkness. Constructed from cast aluminium and finished in white, this security light is as rugged as it is bright. This security light is is made by Eglo International who have been around since 1969 and is one of the largest European manufacturers, with a huge range of traditional and contemporary designs like the Faedo 4 white finish 50w LED outdoor PIR security floodlight and rated IP44 you see here.